Commercials for back to school sales litter television programs across the nation as fall steadily approaches. 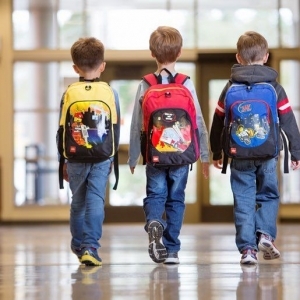 While the countless brands of notebooks, pencils, and school clothes are constantly on display, there is one critical component that these promotions fail to advertise: the potential dangers of an overburdened backpack. Our children carry books, binders, folders, lunches, and even instruments to and from school five days a week. If the weight of these items rests unevenly on their backs, this constant strain may lead to damaging results. Regularly supporting an inappropriate amount of weight may distort the natural curves of the middle and lower back, cause rounding of the shoulders, or require your child to lean forward or sideways and stand off balance. These may seem like harmless effects, but when repeated day in and day out, these habits force the muscles to strain in order to compensate for the uneven weight distribution. This can result in muscle strain, muscle spasm, and back pain in the short term, and potentially lead to back problems later in life if left unaddressed. In addition, a heavy backpack may pull on the neck muscles and cause headaches, shoulder pain, or pain that radiates into the arms. Even with all of this in mind regarding back pain in children, your back to school shopping list still requires a backpack. But, these school bags do not have to be inherently dangerous. With the proper design and attention to its contents, they can be a safe mode of transportation for your child’s school supplies. Here are a few tips on how to choose the right backpack for your child, as well as some simple steps to ensure safe and even weight distribution throughout the year. Some sources claim a backpack should weigh no more than 10-15% of a child’s body weight, but most research on this topic provides inconsistent recommendations for this ratio. While this answer remains unclear, there are still quick and easy ways to reduce, redistribute, and stabilize the weight on your child’s back. When selecting a backpack, choose one made of light material, such as canvas instead of leather. Make sure that it has two padded and adjustable straps that are no less than two inches wide, and contains a hip strap or waist belt to redistribute excess weight from the shoulders to the pelvis. Finally, consider choosing a backpack with wheels so your child has the option to roll their bag instead of carrying it. If your child does carry his or her backpack, stress the importance of using both straps instead of one, and never allow the bag to hang off of one shoulder. Adjust the straps so that the backpack rests just below the neck and two inches above the waist. This way, the weight is kept snug on the back and prevented from sagging below the bottom. When filling the backpack with school supplies, place the heaviest items in first so that they are supported closest to the body, and fill each compartment equally so that the weight is evenly distributed along the spinal column. If your child must lean forward to compensate for the extra weight, the backpack is too heavy. Last but not least, consider having your child carry their lunchbox, instrument, or laptop separately to avoid the strain of including these heavier items in the mix. If your child still complains of back pain at any point during the school year, we offer a free spinal analysis at Grieb Chiropractic Clinic to address the aches and strains life places on a growing body. We can help to reduce back pain in children. Each of the procedures throughout the appointment will be customized to fit a child’s unique height and weight, and applied gently enough to ensure a comfortable and pleasant experience for even the most nervous patient. Careful spinal manipulation with trigger point therapy will align misplaced vertebrae into the proper position, correcting the results of poor posture from an overburdened school bag. Continue frequent visits year-round to maintain optimum spinal health and guarantee a future of full-body wellness. As your child attends school 9 months out of the year, one visit to our office is not enough to correct the existing problem or prevent future injury. Make chiropractic as routine for your child as bringing a backpack to school. To avoid back pain in children give us a call to schedule an appointment at (724)-935-6050 today!